One way to stop the overwhelm is to notice its roots. 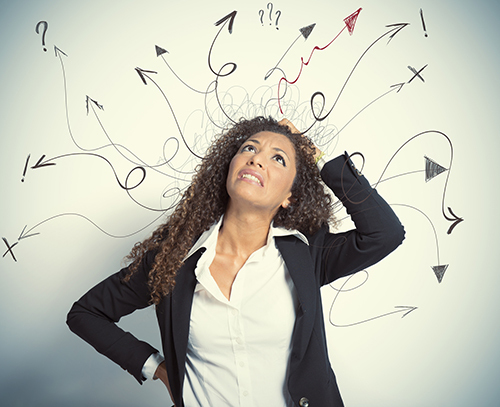 Where does the feeling of overwhelm originate from? If we look only on the surface, we might notice that a feeling of overwhelm arises when we stretch ourselves too thin or allow ourselves to get distracted from what is important. But if we look underneath the surface, by asking ourselves why we do too many things, say yes too often, or get distracted, we will find underlying contexts and driving beliefs and actions. 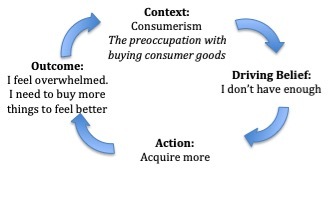 For example, in their book, The 7 Laws of Enough,Gina LaRoche and Jennifer Cohenpoint out that one underlying context (in Western, and particularly American, culture) is consumerism. We live in a society that is preoccupied with the acquisition of things. Marketers promise consumers that if we buy things, we will feel better, and if we don’t, we will feel bad. This context exists all around us, so much so that it can be invisible to us. And while it may have some useful qualities, such as helping to maintain a free society, it can also drive us to believe that we don’t have enough. When we are unaware of the context, we also tend to be unaware of the driving beliefs that go along with it, and we act based on those beliefs without consciously thinking about it. How do we act on the driving belief “I don’t have enough”? We seek to acquire more. And what is the typical outcome? We become overwhelmed by all the things we have acquired. 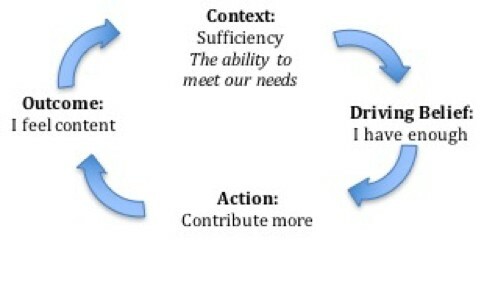 Once we become aware of the context and its driving beliefs, Cohen and LaRoche argue that we can choose to create our own context and driving beliefs. My experience suggests that creating a new context and beliefs will naturally lead us to take different actions to achieve a different outcome. We can create a new context that is more meaningful to us: sufficiency. We can become aware that we already have enough. The sense that we have what we need leads us not to seek more, but to contribute more– at work, at home, in society. And contributing to the betterment of our own lives and the lives of those around us leads us to feel content. This creates a virtuous cycle of contribution and contentment. Which context, beliefs, actions and outcomes will you choose? What other contexts can you identify that lead to either a vicious or virtuous cycle in your own life?